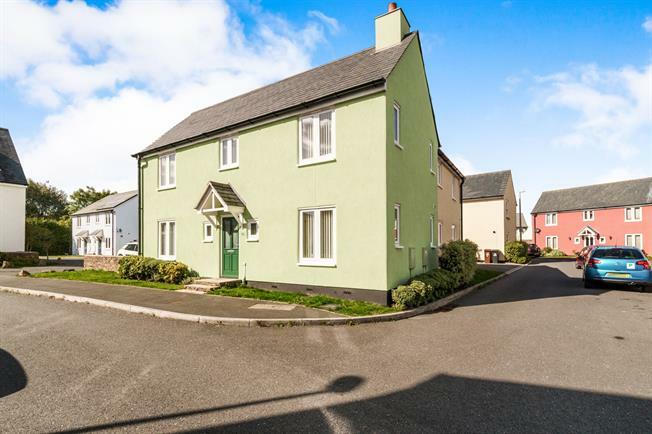 4 Bedroom Detached House For Sale in Plymouth for Offers Over £313,000. Double glazed door. Double glazed windows facing the front and rear. Radiator, under stairs storage, ceiling light. French double glazed doors, opening onto the garden. Double glazed wooden window facing the front. Radiators and wall mounted modern electric fire, spotlights. French double glazed doors, opening onto the garden. Double glazed windows facing the rear and side. Radiator, ceiling light. Roll top work surface, wall and base units, one and a half bowl sink, integrated oven, integrated hob, over hob extractor, integrated dishwasher, space for washing machine and american style fridge/freezer. Double aspect double glazed windows facing the front and side. Radiator, ceiling light. Double glazed window with obscure glass. Ceiling light. Low level WC, pedastal wash hand basin and extractor fan. Double glazed window facing the rear. Radiator, built-in storage cupboard, ceiling light. Double aspect double glazed windows facing the sides. Radiator, fitted wardrobes, ceiling light. Double glazed window with obscure glass. Radiator, ceiling light. Low level WC, double enclosure shower, pedestal sink, extractor fan and shaving point. Double aspect double glazed windows facing the front and rear. Radiator, ceiling light. Double aspect double glazed windows facing the front and side. Radiator, ceiling light. Loft access hatch. Double aspect double glazed windows facing the front and side. Radiator, a built-in wardrobe, ceiling light. Double glazed window with obscure glass. Radiator, ceiling light. Low level WC, panelled bath, shower over bath and walk-in shower, pedestal sink. Shaver point. To the front of the property there is a lawned garden area laid to lawn with a variety of plants and shrubs. Further garden area to the side leading through to the rear. To the rear there is a patio seating area, lawned garden area which is fully enclosed with a decorative stone walling and fencing. Gateway leading out to driveway parking and garage. The garage has power and ceiling light point.